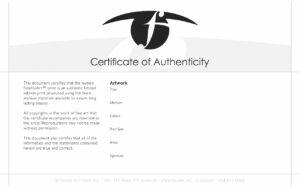 If you don’t already have one, every fine art print should be accompanied by a “Certificate of Authenticity”. This document provides your end customer with the confidence that the finest archival materials were used during the printmaking process and also provides written record of the edition, print date and artists’ signature (should you choose not to sign your artwork). Artists may choose to retain certificate for their records, however, we recommend that a COA travel with the print as it can also contain valuable instructions for print care and framing. Please check out our Facebook Live streams about open and limited editions on our Facebook page. Deciding between open and limited edition prints? Our Limited Warranty states that should any manufacturers defect occur within ten years of the manufacturing date, Fidelis will replace the print at no cost. This document should not be used “AS IS” without our prior written consent. Feel free to use our text/jargon within your own branded COA as you see fit, but be sure to remove “Fidelis” from all warranty claims as we are not liable if you make your own prints or if they are done elsewhere. 1.1 This print is rated to last over 100 years under museum conditions. Under normal handling, storage and display situations, this print will provide many years of enjoyment. As with any artwork, exposure to extreme environmental conditions will lessen the longevity of the print. d. submersion in or saturation by liquids to the front or back of the print, including, by way of example only, water. 2.1 Due to their sensitive and water soluble nature, digital prints require the highest level of care when handling and framing. White gloves should always be worn when working with the prints. 2.2 Gentle dusting with a feather duster or non-abrasive antistatic cloth is often sufficient to maintain the print in a presentable condition. 2.3 Paper-based digital prints should be handled in the same manner as an original piece of artwork. Uncoated prints should be taken directly to a qualified framer and placed behind glass for maximum protection. 2.4 Treatment and handling of the print in a manner other than as outlined above voids any warranty expressed or implied. 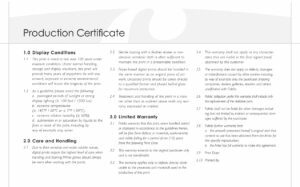 3.2 This warranty extends to the original purchaser only and is not transferable. 3.3 The warranty applies only to defects directly attributable to the processes and materials used in the production of this print. 3.4 This warranty shall not apply to any characteristics that are visible in the final signed proof, approved by the customer. 3.5 The warranty does not apply to defects, damages or imperfections caused by other parties including, by way of example only, the purchaser, shipping companies, dealers, galleries, retailers and others unaffiliated with Fidelis. 3.6 Fidelis’ obligation under this warranty shall include only the replacement of the defective print. 3.7 Fidelis shall not be liable for other damages including, but not limited to, indirect or consequential damages suffered by the purchaser. b. the Artist has full authority to make this agreement. Let me know if you added something specific to your Certificate of Authentication?